Curtis's Bot. Mag. 20 (1804) t. 761. Lamina pinnatilobed to irregularly pinnate, ovate to narrowly ovate in outline, base cuneate or truncate, 20-110 x 20-70 mm, pinnae with apices obtuse to irregularly incised, densely hirsute, interspersed with short glandular hairs. Prostrate to erecto-patent. 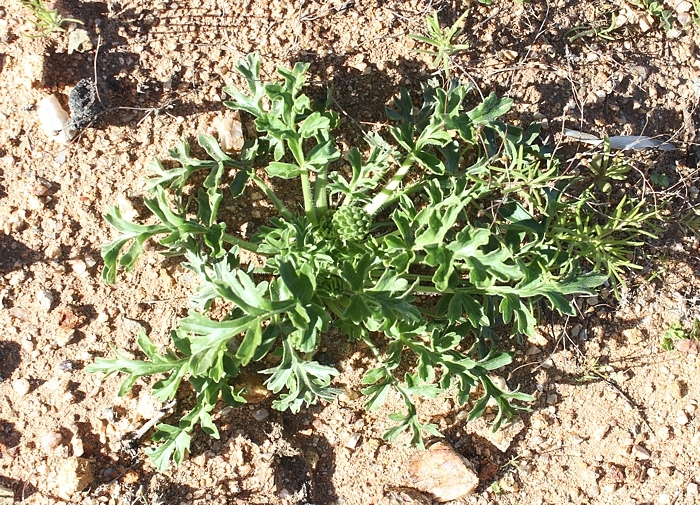 Scape, usually unbranched, without glandular hairs, pseudo umbels with 15-55 flowers, pedicel 1-4 mm. 5, lanceolate, 8-12 x 1-4.5 mm, posterior erect, others reflexed. Hypanthium 27-42 mm. 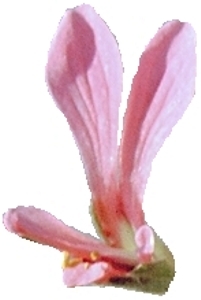 Petals bright purple to bright pink, claws white, apices recurved, posterior unguiculate-obovate, apices rounded or emarginate, 17-25 x 4-10 mm, anterior spathulate, apices rounded, 8-12.5 x 2-4 mm. 5 fertile, remaining straight, posterior 7.5-14 mm, lateral two 8.5-15.5 mm, anterior two 10-17.5 mm. 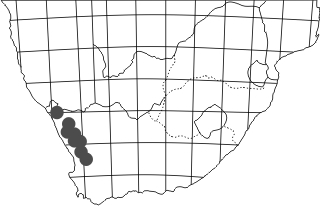 P. incrassatum is very frequent along N7, particularly Kamieskroon to Springbok. 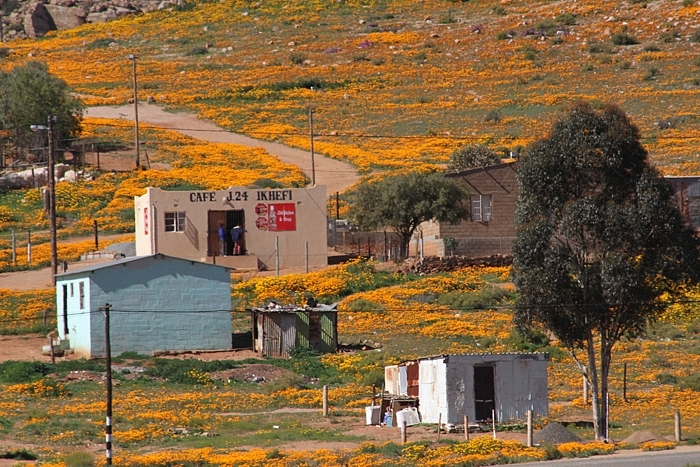 In the photo are the Springbok suburbs in early August 2014 when the harsh reality turned surreal. Sadly, South Africa has globally one of the highest levels of income inequality. 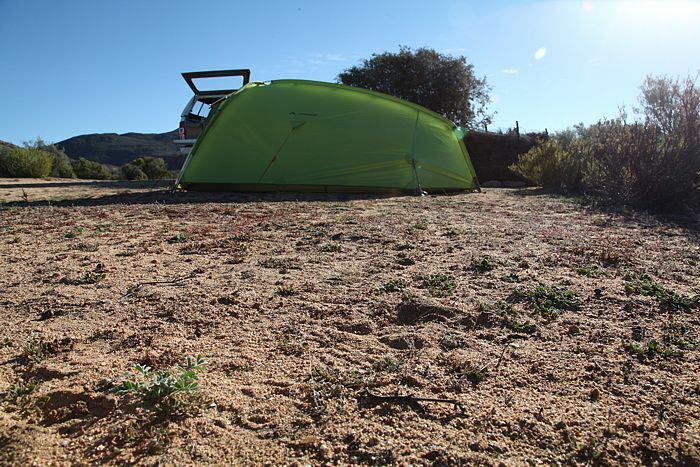 One does not often have the luxury of sleeping among hoareas, but P. incrassatum is so common in the northern Kamiesberge that it is sometimes difficult to avoid them when putting up a tent! 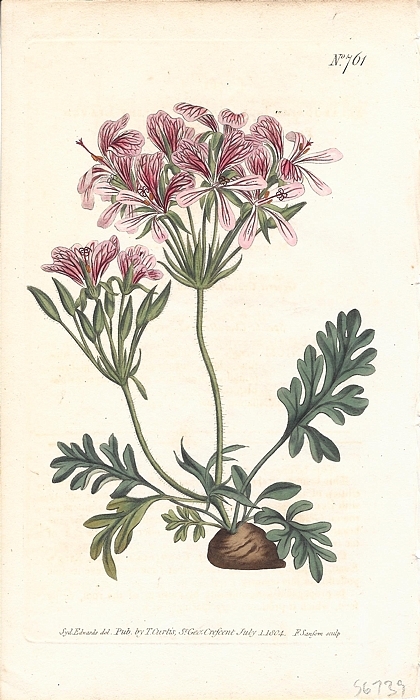 Curtis's Botanical Magazine, 1804, Tab. 761.